An unusual hat has been making the rounds among public radio personalities in New York. It’s rested on the heads of some esteemed hosts: Leonard Lopate, Brooke Gladstone and Kurt Andersen, among others. On their heads, the beat-up trucker-style cap makes an obviously false claim: “I AM LAKSHMI SINGH.” In photos of the hat and its wearers, the real Lakshmi Singh, NPR newscaster, is nowhere in sight. The hat has already made the trek from California to New York, and its travels aren’t over yet. Its owner, Studio 360 producer Sean Rameswaram, wants it to end up on the head of the real Lakshmi Singh. Its appearances on WNYC hosts, Rameswaram’s friends and even a Taylor Swift cutout are just a warm-up — and an effort to get Singh’s attention. Lakshmi Singh wearing the “I AM LAKSHMI SINGH” hat — it’s Rameswaram’s dream. “This is a celebration of her and her work,” he said. The hat came into existence in 2012, when Rameswaram was “a part-time public media employee who aspired to be a full-time public media employee,” he said. He was living with his parents in Los Angeles and angling for a full-time job on a nationally distributed public radio show. When he lost faith during the long search, he found reassurance in hearing Singh on NPR’s morning newscasts. Canadian-born to Sri Lankan parents, Rameswaram felt like an outsider to the field he was trying to break into. Hearing Singh’s name every day gave him faith that “someone with another weird Indian-ish name” could make it in public radio, he said. A hat would be a tribute to her. He tried ordering one from Zazzle, an online store selling personalized gear. But the company, possibly deducing that Rameswaram was not in fact Lakshmi Singh, rejected his order. Tessa Stuart, Rameswaram’s girlfriend, took matters into her own hands and made him the Lakshmi Singh hat for his 27th birthday. “I got the trucker hat in a little shop in L.A.’s Chinatown for $3, and some iron-on letters from a craft superstore in the Valley,” she explained in an email. The letters are a bit crooked. The hat drew attention as Rameswaram wore it in public. “People love it,” he said. “They’ll stop me on the street, take my photo at a bar, take a photo from 30 feet away.” A photo of Stuart wearing the hat ended up on Fresh Air’s Tumblr. “It’s the only way I can see this ending,” Rameswaram said. Rameswaram had emailed Singh to arrange a photo, to no avail. But after a reporter emailed her about the hat, he got an answer. And it looks as if Rameswaram’s dream might come true. Singh alluded to a “gathering in mid-May at NPR” where she said she’d be “happy to wear the hat.” “Although, I’d bet that my family, friends and colleagues will initially look puzzled and ask why I didn’t just wear a name tag,” she added. 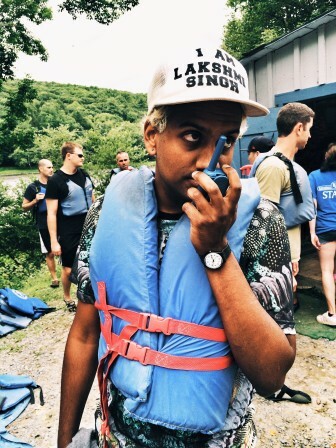 “I’ve been joking about starting a one-item Etsy store — Just Lakshmi Singh hats,” Stuart said. But Rameswaram is thinking bigger, with hats for any and all personalities the wearer desires — “I AM KAI RYSSDAL,” “I AM ROBERT SIEGEL” and so on. The WNYC event mixed whimsy and seriousness to explore issues of diversity in public radio. And don’t forget to do one for @hari from the NewsHour!!! I love listening to Lakshmi Singh on NPR, So much so that I’ve named my beautiful “goddess of fire” motorcycle “Lakshmi Singh” She is the most beautiful bike i’ve ever seen! lol! I think she’s attractive too (who wouldn’t? ), but I don’t have any such gimmicks to meet her.